Leading opposition candidate, former Vice President and standard bearer of the People’s Democratic Party, (PDP), in the February 16 Presidential election, Alhaji Atiku Abubakar has unveiled antidote to ease of doing business, saying his administration will dismantle all toll gates to MDAs. This is as majority of Nigerians who watched proceedings at ‘The Candidate’, a political dialogue programme managed by the Nigerian Television Authority (NTA) monitored in Lagos on Wednesday expressed disappointment over what they described as avoiding to explain key issues of discussion raised at the meet. However, unveiling his Plan to get Nigeria Working Again before business leaders in Lagos, entitled “Atiku’s Plan, My Plan to get Nigeria Working Again”, the PDP Presidential candidate said he would operate a technology driven economy which would make human interface in economic and financial transactions nearly impossible. 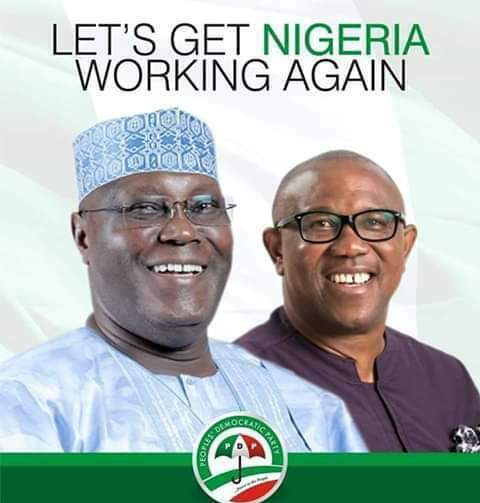 Joined by his running mate, Mr Peter Obi, Atiku took flying economies like the United Arab Emirates and China as some of key emerging economies where human intervention in financial transactions are minimal with unprecedented application of technologies. In his lead argument, Atiku averred that the Nigerian public sector harbours too many tollgates in government ministries and agencies which must be dismantled to up ease of doing business and eliminate corruption. While stressing that “It was often when people are regularly exposed to cash mountains in the course of their official duties that they are tempted to steal”, he noted that “Under a technology driven economy, payments for taxes, duties and levies would be done online and without human interface”. “There are a lot of tollgates in our system and we must reduce the meeting points with cash by introducing technology. It has happened in the United Arab Emirates and it can also be done in Nigeria. “On job creation, I would look at how other developing nations have conquered unemployment and adopt their strategy. China with a population of 1.2 billion people has 800million people employed and if they can do it, Nigeria can also do it using MSMEs’. On the lingering issues surrounding Nigeria’s oil and gas industry, the PDP Presidential hopeful also promised to privatise the Nigerian National Petroleum Corporation (NNPC) even at his personal detriment, stressing that the private sector has all it takes to deliver infrastructure to the citizens with government acting as regulators. He waved away the idea of assuming a ministerial portfolio either for Petroleum or education, saying he wouldn’t join presidential duties with ministerial portfolio since he does not have the requisite experience and qualifications to handle such responsibilities. “Instead, I would bring the best brains who would deliver on infrastructure and an efficient economic model that would make Nigeria a preferred investment destination. Under an Atiku and Obi administration, Nigerian women and youth would collectively account for 70 percent of positions, while older men would take the remaining 30 percent”. Atiku criticised the current administration for the delay in passing the Petroleum Industry Governance Bill. He noted that the level of unemployment in the country was worrying, saying that the lack of adequate jobs could create a bigger problem if left unchecked. He said, “We must create jobs, if not we will get mobbed one day by the unemployed youths. They are like a time bomb… When businesses are folding up, shops are closing, industries are falling, foreign direct investments are not attracted; poverty is embarrassingly becoming our trademark, the rating of our hardworking businessmen by international rating agencies is becoming dismal. Majority of the business leaders at the town hall meeting welcomed his ‘Plan to get Nigeria Working Again’, saying Nigeria is in need of reforms that will make government businesses be run for the interest of the wider private sector. Observers say Atiku Abubakar is becoming too impatient to see in his lifetime, the kind of economic and social development capable of drastically cutting the prevalence of poverty in Africa’s most populous nation.